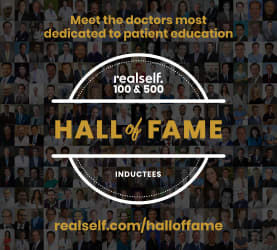 RealSelf Hall of Fame Unveiled: RealSelf Honors Top 1,000 Highest-Rated and Most Engaged Aesthetic Doctors. The RealSelf Hall of Fame is an honor recognizing more than 1,000 board-certified aesthetic doctors from 402 cities across the United States, the United Kingdom, Canada, and Australia for their high patient ratings and commitment to consumer education. For eight years, the annual RealSelf 100 and 500 awards recognized doctors with outstanding records of high patient ratings who have given back to the RealSelf community by providing credible, valuable insights in response to consumer questions about elective cosmetic treatments ranging from surgical procedures to minimally invasive technologies to cosmetic dentistry. For the first time ever, RealSelf celebrates the Hall of Fame, a culmination of eight years of recognitions made through the RealSelf 100 and 500 awards program. "Making the RealSelf Hall of Fame requires a commitment to helping patients make informed and confident choices," said Dr. Lara Devgan, RealSelf Chief Medical Officer and board-certified plastic surgeon. "From answering consumer questions and sharing before and after photos to encouraging patients to leave open and honest reviews, the valuable insights this group provides help make it possible for RealSelf to bring transparency to the medical aesthetics industry." 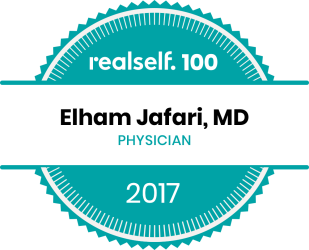 To be included in the RealSelf Hall of Fame, doctors must have received a RealSelf 100 or RealSelf 500 award in the past. The awards program, which first launched in 2010, honors the top-rated and most engaged board-certified aesthetic doctors on RealSelf. Doctors are ranked in three categories: earning patient reviews, answering consumer questions, and sharing before and after treatment photos. In order to be recognized in any given year, doctors must maintain the distinction of Top Doctor or Top Contributor and uphold a high rating. Dr. Jafari and Amoderm have been selected as 2017 RealSelf 100 winner. "Your commitment to patient education, along with your distinctive ability to inspire your patients to share their story with our community, have placed you in the top 1% of doctors who support the RealSelf community. Thank you for helping millions of consumers to make informed decisions about their aesthetic treatments." Dr. Jafari has been announced as one of 100 board-certified doctors worldwide to receive the RealSelf 100 honor, an esteemed accolade recognizing the highest-rated and most active doctors on RealSelf, the world’s largest online aesthetics community to learn about cosmetic treatments and connect with doctors and other clinicians.